WASHINGTON — Special report from Dominic Sputo and Lumenlife (www.lumenlife.org) The White House expects North Carolina pastor Andrew Brunson to be released by the Turkish government and returned to the U.S. in the coming days, two years after he was detained, according to two senior administration officials and another person briefed on the matter. 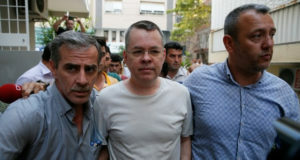 Under an agreement senior Trump administration officials recently reached with Turkey, pastor Andrew Brunson is supposed to be released after certain charges against him are dropped at his next court hearing, currently scheduled for tomorrow, Friday (IN JUST A FEW HOURS LOCAL TURKEY TIME), the senior administration officials and a person briefed on the matter said. The Trump administration, however, isn’t fully confident that Turkey will follow through with the Brunson agreement because Ankara was close to a commitment to release him several months ago but did not, one senior administration official said. PLEASE continue to pray for the RELEASE of Andrew Brunson until he is safely home. Thank you, always, for your prayers and support in our mission to inspire Jesus followers to remember those who suffer for His name. Brother Dominic is a former pastor, former businessman, and passionate follower of Jesus. Author of Heirloom Love and Founder of LumenLife, Dominic believes in teaching truth and inspiring love to awaken and mobilize Jesus followers to remember and care for their persecuted brothers and sisters so that the world might know that Jesus is the Son of God.